LAHORE: (Friday, November 23, 2018): Punjab University Centre for Clinical Psychology (CCP) in collaboration with Pakistan Institute of Living & Learning (PILLS) organized a workshop on “Addiction Psychiatry: Theory and Practice”. 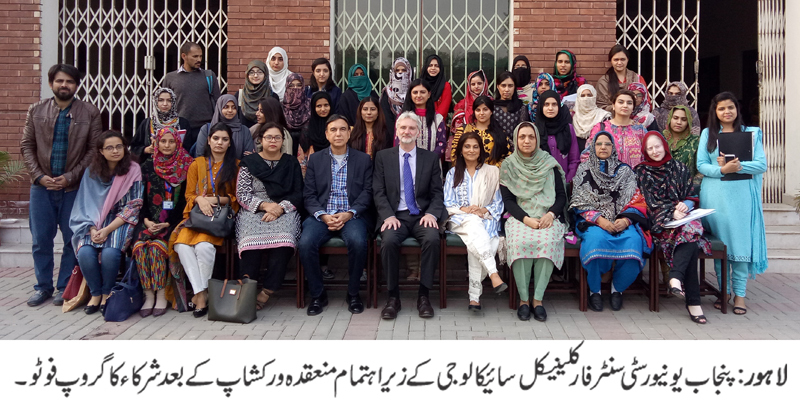 Dr. Joseph Meagher, Associate Professor, University of Leeds and Consultant Psychiatrist, Medical Leads of Addiction, Leeds & York Trust, UK was resource person while Director CCP Dr Saima Dawood, faculty members and MS, ADCP and PhD students participated in the workshop. Dr Saima welcomed and thanked the resource person for conducting an insightful workshop on dynamics of addictions in theory and practice. The participants acknowledged that it would help to enhance their understanding about addiction and the practical issues surrounding the problem. Prof Dr Nusrat Hussain also appreciated the participants and emphasized that such activities would further the knowledge base of clinical psychology.